A review of Kiehls skincare for men. Like most modern men of today male grooming is now part of our daily routine and has come a long way from just keeping the hairs on our heads in check. Now more than ever with the rapid growth of social media in the palms of our hands we are bombarded with regular images of A-list celebs looking fresher and more radiant than ever before. For me personally I have felt the need to also make myself look just that bit better. Firstly for me was understanding my skin type, which is slightly oily and can give off that unwanted excess shine. So after several months of trial and error I've found what I call the holy grail of (non shine) men's moisturiser. 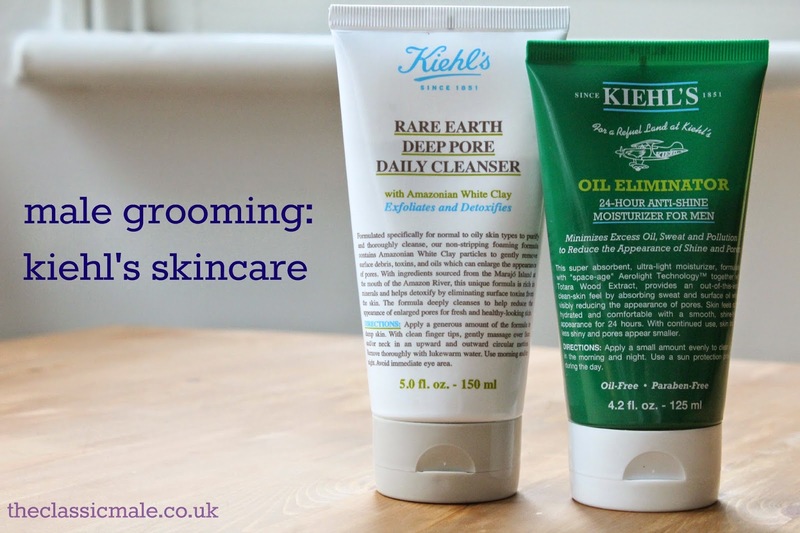 KIEHL'S Oil Eliminator moisturiser is the best I have ever come across (I've tried a few!) and more than likely the last product I'll ever need. A small amount is all that is needed to leave me feeling fresh and ready to head off into my day. Well into the afternoon my face is still looking pretty much the same as it did first thing, no shine, no dry patches, itching or excess oil like many other products. The smell is refreshing yet masculine, kind of a wood/bark like scent given off from the totara wood extract, obviously with some standard, face cream like scents too. I was curious too about its claim to visibly reduce pores, again I was not let down. My pores are slightly more visible than average, but even after the first use of this I could see the difference. I really do recommend this to any other men looking for something to leave you looking shine free, feeling fresh and ready to set off feeling confident with the day ahead. The other product i picked up in Selfridges was the Rare Earth Deep Pore Daily Cleanser. A morning and/or night cleanser mainly consisting of white clay particles, which again after the first use felt my face feeling smooth, refreshed and cooled. I'm no expert but white clay sourced from the Marajo island at the mouth of the Amazonian River (as the department lady preached to me) sold me this product.